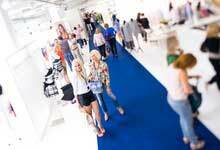 PROGRAMMED to take place from 1 to 3 March in Munich, the Supreme Body & Beach salon expects to feature exhibits of 375 bodywear labels. Among new exhibitors at this year’s edition will be Lionella Lingerie and Perofil from Italy, Impetus from Portugal, Anabel Arto from Russia and Minerva from Greece. At mid-December 2014, the organizers said that there was still room to accommodate other newcomers. The expanded range of labels at the Bavarian show could attract more buyers from other Lande, making the salon a more effective point of entry into the German market.